Since Captain William Matson’s maiden voyage aboard Emma Claudina delivering plantation supplies from San Francisco to Hawaii in 1882, the name Matson has been synonymous with Hawaii in the shipping business. For 136 years, Matson has continued to provide a vital link between the mainland and the Islands, continuously upgrading its fleet and equipment in step with improving technology and the needs of Hawaii’s growing economy. Our latest investments, both in fleet and terminal infrastructure, underscore our long-standing commitment to serving our island communities with the most reliable, efficient and environmentally friendly operations in Hawaii for the long-term. Our new Aloha Class and Kanaloa Class ships are being built specifically to meet Hawaii’s freight needs into the future, while reducing our environmental impact and improving our efficiency for decades to come. 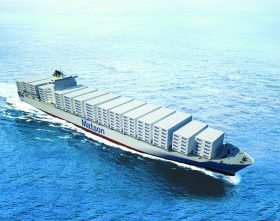 Largest Containership Built in U.S.